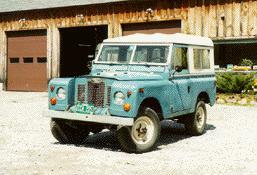 This SIIA 88 has come to us from Western VT for a frame swap and upgrade to parabolic springs. In our unique frame swap system this 88 will be ready to go in a matter of days, for only $3800 including the new Marsland galv. chassis. Check out our Series II-III service section for more information on our frame swap system. 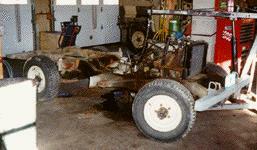 Here the 88 has been lifted in our frame swap system and the old rusted chassis taken out. 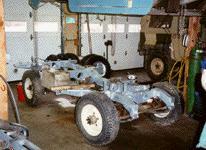 Next the engine and running gear will be removed from the rusted frame and installed on the new Marsland galv. frame. 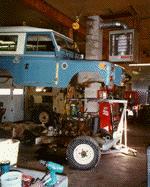 This image shows the new frame set up with the axles and new parabolic springs. Next will be the drive train and then putting the body back on. Here is the completed project a few days after it was brought into the shop. It was a nice running 88 that suffered from a rusted frame and bad springs. Now it has a new galv. frame that will last for decades and parabolic springs to smooth the ride and give it better off road manners. We also installed a new seat box to repair some rust, a new wiring harness and a few other service items to get this 88 ready for the owner to enjoy. 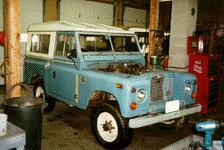 Let us know if we can refurbish your Land-Rover. We'll be glad to help. For information on our parabolic springs and a test of this 88's suspension: Go Here!